Here are three electrifying reasons to bring an outdoor fireplace to your home. There are many reasons why the addition of an outdoor fireplace is valuable. It can bring that “wow” factor. It increases home value. It’s a current trend. And whether you prefer gas-burning or wood-burning fire, adding this focal point can you give you some unexpected benefits. Here are three electrifying reasons to bring an outdoor fireplace to your home. It extends your outdoor season: Combining comfort and warmth, an outdoor fireplace allows you to be outside more months of the year! Take more time to gather with family and friends around a cozy fire. If you live in an area where the weather is always warm, an outdoor fireplace can function as another area of your home and will encourage you to spend more time outdoors. The flames from your fire will light up the night and will help feature this stunning focal point of your home. It’s an easy process: Adding an outdoor fireplace is the ultimate design project because you won’t have to worry about tearing down existing walls, getting the carpet dirty or ceiling height. You can turn a completely empty space into a focal point of your home. Tall chimneys elevate the eye and create wonderful depth for your outdoor space. The Montana Wood Fireplace gives great depth to an outdoor space and uses FireBrick technology to give you 25% more radiant heat. Style and function all in one! There are no style limitations: Afraid an outdoor fireplace won’t fit your style of home? Think again! Modern, traditional, rustic, eclectic or whatever style your home fits into, you won’t have trouble finding an outdoor fireplace for it. 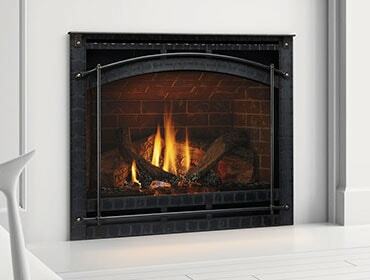 If you’re working with a smaller deck or patio, the Courtyard Gas Fireplace will fit right in. Blending classic design elements with strong performance, this fireplace adapts to a wide variety of styles. Extend your unique style to the outdoors and enjoy the benefits of an outdoor fireplace! Don't forget to check out more of Heatilator's outdoor products! Support Heatilator in The Battle of the Brands!